Large lot sizes are a prime feature of the estates located in Cocoanut Bayou on Siesta Key. This development is located on the northern part of Siesta Key and it includes Little Pond Lake, Cedar Park Circle, some homes located on Hiegel Avenue as well as Mangrove Point. The residents of Cocoanut Bayou are provided access to a gated pathway that leads to a private beach on the Gulf of Mexico that is deeded to the residents of Cocoanut Bayou. 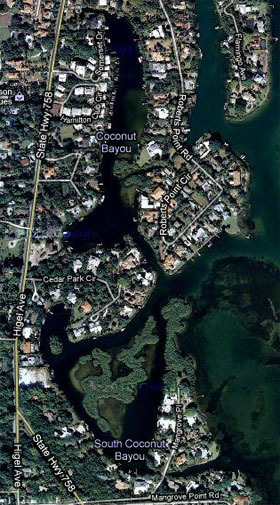 Many of the homes in Cocoanut Bayou offer water frontage and are located on the Roberts Bay side of Siesta Key. These homes have jetty’s perfect for docking your boat home side. The waterways around Cocoanut Bayou have been dredged offering deep water access to the bay. From there you are just a few minute cruise to the drawbridge on Siesta Drive that provides boaters with direst access to Big Pass, the Gulf of Mexico and the fishing to be had offshore. Many of the homes in this area top the million dollar mark. The home sites are large and the foliage is very tropical giving these residences the feeling of being remote Caribbean get-a-ways while still maintaining easy access to the mainland shores of Sarasota Florida. There is a Cocoanut Bayou home owners association that provides supervision over the development ensuring it is well maintained and looked after. The unity this association provides Cocoanut Bayou makes the neighborhood a tight-knit community of affluent home owners. Many lasting business relationships and friendships have begun here. In 1987 Siesta Key Beach was determined to have the whitest and finest sand in the world at the Great International White Sand Beach Challenge. This amazing beach is located just minutes away from Cocoanut Bayou, this fabulous beach on Siesta Key has driven and preserved the values of these homes for decades. For those looking for some of the best homes that can be found on Siesta Key, they will certainly be able to find them in Cocoanut Bayou. Below are all of the current real estate listings available for sale in Cocoanut Bayou as of 6AM this morning.